The arch-conservative queen of snark, Ann Coulter, has taken a poisonous bite out of Newt the Gingrich. That’s what those two red marks are on the side of his neck — and they’ll fester. The longer he enjoys front-runner status in the Republican presidential primary race, the more obvious his weird, quirky inconsistencies will become. The media aren’t going to give him a pass now, and the Democrats will save a lot of juicy stuff for the general election if he’s the Republican nominee. Many people (including me) concluded long ago that Mitt Romney has the best chance of beating Barack Obama next year. That’s based on the fact that he’s a successful business executive and former governor who’s moderate enough to appeal to many independents and moderates — the voters who will decide the election. Those on the right will vote for him, even if they have to hold their noses as they do it. Even a few disaffected Democrats will join independents and moderates to support him. That will most likely be enough to win. To those who are too ideologically rigid to accept Romney, I would remind them that politics is the art of the possible, and it isn’t possible to govern if you can’t win elections. They should have learned that lesson in 2010, when extremist, sometimes goofy tea party candidates cost the Republicans at least two Senate seats. That’s the only reason Harry Reid is still in the Senate — in service to ideological purity, they gave up a chance to defeat the Senate majority leader. Coulter didn’t unveil all the possible criticisms of Newt. There’s more to come, and it won’t be only from her. It’s true that the liberal media attack Republicans unfairly. But that’s a fact to be dealt with, not ignored by nominating a candidate [Gingrich] who keeps giving the media so much to work with. 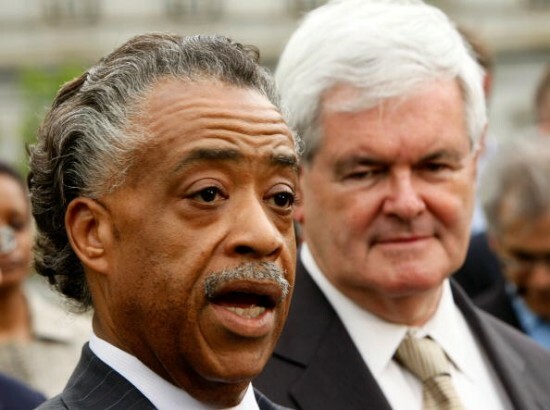 Gingrich has spent his years since then having an affair, divorcing his second wife and making money by being the consummate Washington insider — trading on access, taking $1.6 million from Freddie Mac, and palling around with Hillary Clinton, John Kerry, Nancy Pelosi and Al Sharpton. Even Chuck Schumer wouldn’t be seen doing a joint event with Al Sharpton! But Newt seeks approval from strange places. I’m perfectly capable of voting for either a Republican or a Democrat in any election. In this case, I think Obama has to go, and I hope he’s defeated next November. But of the current crop of Republican hopefuls, the only ones I can see voting for are Romney and Huntsman (who appears to have no chance of winning the nomination). I wouldn’t vote for Obama if the Republicans nominated one of the others; I’d probably just stay home. I will vote for which ever of them is nominated. Each has points I think good and points I think unfortunate. As to Gingrich, here is a National Review article suggesting both favorable and unfavorable comparisons to Churchill. Many within Churchill’s party expressed some of the thoughts now expressed about Gingrich, before and for a while after he became the war Prime Minister in 1940. I don’t think Gingrich is any more comparable to Churchill than Obama is to Teddy Roosevelt. Hayward’s article is interesting, in any case. There’s been a lot of historical noodling about whether the times create great men or great men create their times. I think it’s a mix of both. When you look at the American Revolution and the founding of the United States, the number of truly great men who seemingly came out of the woodwork is truly amazing. The fact is, they would have been there in any event; the times just brought them to the forefront. When you look closely at the backgrounds of Churchill and Gingrich, it seems clear to me that Churchill was well-prepared to deal with the existential crisis Britain faced from the threat of Nazi Germany. This was true because even his failures — most notably his responsibility for the Gallipoli disaster when he was First Lord of the Admiralty — prepared him to deal with war. Beyond that, he also had significant military experience during the Boer War and while commanding a battalion on the Western Front. That kind of experience was what was needed of a wartime prime minister. But in reality, who knows? The times play a part in making the man, and perhaps Gingrich can rise to the challenge. But I doubt it.